Oh great…another content checklist. I know what you’re thinking. So, why is this one any different? These tips are backed by years of experience – and, they actually work. This list includes strategies I use myself, and actions I instructed my team to take when I managed writers. There is no doubt in my mind that consumers are inundated with online content. However, what they are not inundated with is compelling content that grabs their attention and causes them to take action. That is the content that is needed. Are You Ready to Talk Some Content? Throughout the years, I have learned through trial and error what works and what doesn’t in terms of content. Below is a giant list I have lived by as a writer. It is a checklist for developing content that will connect with your target audience on a personal level, thus increasing engagement and traffic. I start with this tip because it is the most important. Before you type even one word, take the time to imagine what it would be like to be the person reading your content. You might even close your eyes. Have you ever heard of the “you” attitude? It is a powerful communication principle. At the simplest level, it means literally using “you” more often in your message. The goal is to make it about the other person (a.k.a. reader). On a more advanced level, it means crafting your entire message around the person receiving it. You can read more in my past SEJ post: Writing Panda-Pleasing Content Your Audience Will Actually Care About. It’s important to reach your readers in a deeply emotional way—this applies even if you are in a B2B industry, because you are still dealing with a human being who will make the decisions. A great tool you can use to see the emotional value of words is the Emotional Marketing Value Headline Analyzer. It’s an oldie but goodie! Stories have been used as a form of learning and communicating since the dawn of mankind. The authors of Think Like a Freak describe the power of storytelling well, “why are stories so valuable? One reason is that a story exerts a power beyond the obvious. The whole is so much greater than the sum of the parts—the facts, the events, the context—that a story creates a deep resonance” (Dubner and Levitt). You are an expert on your topic, so there is no need to regurgitate the same content that is already on thousands of pages already. Consider what opinion or insight you can give on a topic. Stay on the lookout for news and events that you can use as content topics. For example, can you tie in a relevant topic to something that just happened in the news? To create powerful content, you need to constantly view the communication you come in contact with from a critical eye. Look for ways to reshape concepts and ideas into something new and useful to your audience. It can be challenging to come up with an influx of content topics. Stay abreast of what’s going on in the world and also keep your eyes open to the messages you receive on a daily basis. You might be inspired by a movie, newspaper article, magazine feature, radio commercial, or even junk mail. You can mold these messages into content that connects with your audience on your topics. Keep a folder titled, “Content Topics” Any time you come across something that is remotely interesting, put it in your folder. When the time comes to write, you will have plenty of options to choose from instead of staring at your blank computer screen. Google Trends, Google Alerts, BuzzFeed, BuzzSumo, and Addict-o-Matic are among the many online resources that can help you generate interesting topics for your readers. You might write a Pulitzer Prize worthy article or landing page, but if you don’t tell your readers what they are supposed to do, then you have missed out. If they should call your company, buy your product or download your free book, tell them! A big mistake is to start off a homepage, landing page or any other Webpage with describing how great you are or your company is to the reader. No one cares in the beginning. What searchers want to know is if you have the information they are looking for. Ok, so I kind of just threw this one in there because it is a huge pet peeve. Doing a Google search for “welcome to our website,” generates 21.6 million results! Too many websites use this phrase as their heading on their homepages. That is a huge waste of valuable space. It should be personal and compelling. People on average read only about 20 percent of the text on a page. That means you have to grab their attention in your headline and first paragraph to encourage them to keep reading. Once you have hooked your reader with your headline and first paragraph, make the rest of your message easy to follow. Err on the side of simplicity. Reading level is often ignored, which is a tragedy. It’s important to write at the appropriate reading level for to ensure your audience is able to understand what you share. Also, Google pays attention to reading level. 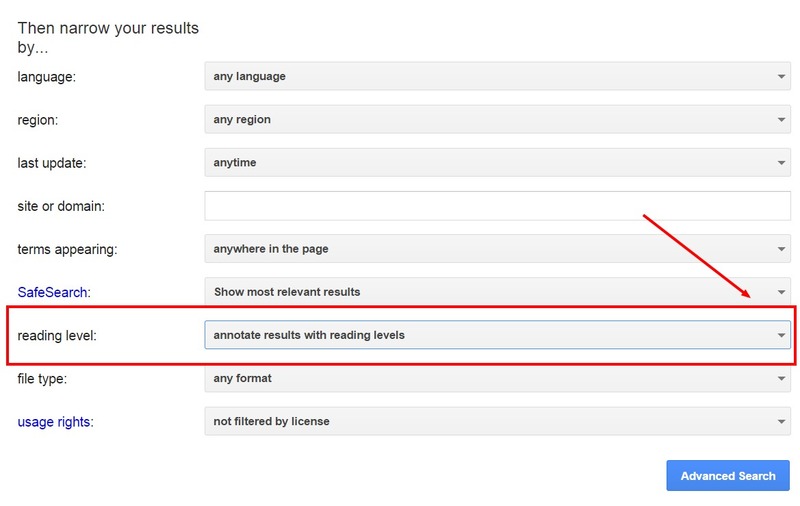 Do a Google advanced search and select “annotate results with reading levels,” as shown below. You will then see the percentage of search results written at a basic, intermediate, and advanced level. You have to go beyond advice when writing content and show readers how your message can fit into their lives. This concept is illustrated in the book, The Tipping Point: How Little Things Can Make a Big Difference. Researchers conducted a study of college students who were given booklets encouraging them to get a tetanus shot. They discovered when a map showing the location of the health center and hours available to get the shot were added to the booklet, the response rate jumped dramatically. No longer was the message just about the dangers of not getting a tetanus shot, now students could fit the action into their lives. According to the author Malcolm Gladwell, “it was a subtle, but significant change in the presentation” (Gladwell, 98). Sometimes, that is all you need. What is going through the reader’s mind? What concerns does he or she have? What about his or her interests? You need to get personal with your content, so it pulls in your readers. Determine who your ideal customer/audience is and tailor your message to that persona. There is a lot of great tips on persona development, included in this SEJ post: Marketing Personas: The Complete Beginner’s Guide. To build on the “be personal” tip, you should be able to get your reader to identify with your content. That can be accomplished through storytelling or even just answering the questions you know are on his or her mind. When it comes to articles and blog posts, lists perform well. If it makes sense to create a list, do it. Just like lists, people also love to read answers to the top questions asked about a product, service or general topic. According to Paco Underhill, the author of Why We Buy: The Science of Shopping, “we still can’t get away from our basic human need to reach out and connect with other people” (Underhill, 240). Make sure you keep that in mind as you create your content. Successful content requires planning, which requires a calendar. It doesn’t matter how much content you publish or the size of your company, an editorial calendar is a must. Find out what you should and shouldn’t do by reading this post: Do’s and Don’ts of Your Brand’s Content Calendar. Years ago, I listened to a conference speaker make a point that every piece of content you publish must have a purpose. 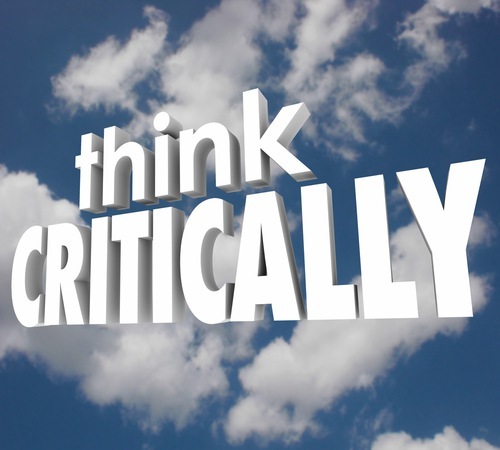 Is it to inform, educate, entertain, sell, or brand your company? Be able to answer that question. A couple of weeks ago, I heard Trailer Park Inc.’s SVP of Marketing Innovation Mike Tankel present at a digital marketing event. His entertainment agency is known for its work in Hollywood, including campaigns for major motion pictures and even The Oscars. Mike illustrated the power of giving customers a “behind the scenes” look into a business. People love to see what goes on in the background—develop content that gives them a glimpse into your company. What tone is right for your brand? Think of tone as your company’s voice. You need to know what your brand stands for and pinpoint your target audience. That will help you determine the appropriate tone for your content. Once you know the appropriate tone or voice, be consistent. If there are multiple writers creating content for your company, they all need to communicate with the same voice. Content and SEO shouldn’t be separate. Content feeds search engines, but help them understand what you are about and make it easy for them to find you. That is where SEO comes into play. You knew eventually keywords would come up, didn’t you? It is possible to have amazing content and still incorporate keywords. Know what words your audience is using to search and sprinkle them in your content. Don’t ignore the importance of a killer title tag, which is also optimized. The same goes for your meta description tag. Make them search engine and searcher-friendly. There are so many platforms available to get your content to the masses. Use a mix of landing pages, articles, blog posts, white papers and, of course, social media. Also, consider turning your great text into an eye-catching infographic or intriguing video. You can still be personal, even if you are writing for a B2B market. There is a human being on the other end reading your content. Identify that persona and write accordingly. Knowing your audience can’t be stressed enough. Once you know exactly who you are writing to, develop content that is relevant to them. A long time ago, a business owner asked me to look at his website. He said he was creating a lot of great content, but no one was converting. It took me about two minutes to realize the culprit. The spelling was horrendous. Even references to his own services were misspelled. 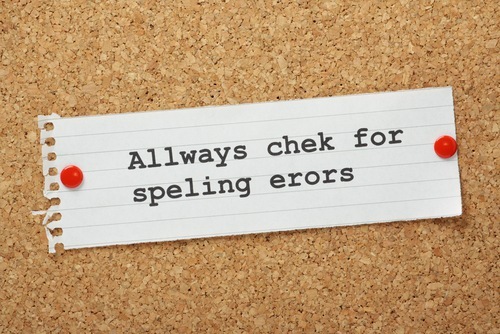 If you are a searcher, how credible would you view a website riddled with spelling and grammar mistakes? Let people know about your great content by sharing it through the various social networks. Social Media – Fact or Fad? Sign up for FREE social media & online marketing tips!